Here’s our list of the top 5 homes that really stand out because of their driveways. Brick lends an air of elegance and tradition to any driveway. Unfortunately there is one big problem with brick – it is expensive! Fortunately, despite appearances, this driveway isn't brick at all! It is stamped concrete, coloured to look like brick. Compared to brick, concrete is faster and less expensive to install, and it is a more durable material. Overtime, the look will continue to add an elegant look to homes whether they are massive mansions or cozy cottages. This driveway in Palo Alto., California was designed by Jeni Webber, a landscape architect. Webber wanted to reinvent the driveway by incorporating it more into the landscaping and making it more environmentally friendly. By laying two strips of concrete, Webber created a garden median planted with low growing plants like blue star creeper and Corsican mint. While this layout may not be perfect for every climate, this unique design provides better drainage and a much greener driveway. Everything about this $100 million property says opulence. It has fountains, a golden door, waterslide, tennis court, turreted stone exterior and private pier, all sitting on eight acres just 25 miles from Manhattan. The patterned driveways connect multiple buildings on site and reflect the roaring 20s architecture. The current owner is notoriously secretive, so secretive in fact that no one knows who he or she is, which makes finding this stunning driveway even more interesting. 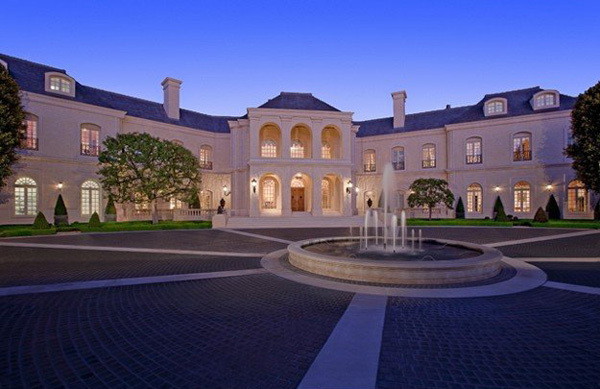 Spelling Manor, a French chateau inspired mansion built in 1991 in the Holmby Hills of Los Angeles has one of the most beautiful driveways in the United States. After passing through the gated entrance, visitors drive along the long driveway which passes through gardens and trees before reaching a motor-court capable of accommodating as many as 100 cars. The driveway is as impressive as the mansion itself which has 123 rooms, was purchased in 1991 for $85 million and went on the market for $135 million. Without the distinctive driveway and motor-court Spelling Manor wouldn’t be the same. These are only a few of the magnificent homes that stand out because of their walkways and driveways. We love finding new concrete driveway inspiration from all around the world to help us give our customers a unique entryway to their own home.